Anchor: The leaders of South Korea, the U.S. and North Korea continue to exchange messages as they reel from the collapsed nuclear negotiations in Hanoi in February. 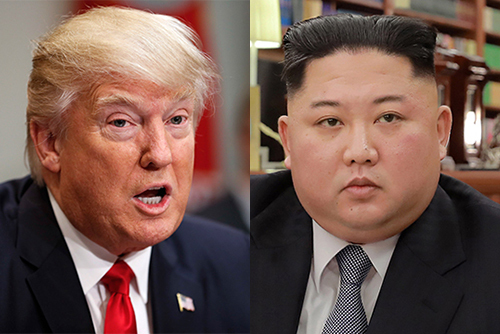 As South Korean President Moon Jae-in tries to revive the stalled Washington-Pyongyang talks, U.S. President Donald Trump and North Korean leader Kim Jong-un reiterated their adamant positions on denuclearization. "I have a good relationship with Kim Jong-un. He just said the other day he looks forward to more talks. Talk is OK. Talk is OK... "
U.S. President Donald Trump says he is in no rush for a third summit with Kim Jong-un. Speaking at a business roundtable in Burnsville, Minnesota on Monday, Trump responded to Kim's speech last week. "I don't want to move fast. Right now it is moving along perfectly. And I have a good relationship. The sanctions are on. We got our hostages back. Our remains are coming back." "[If the U.S. calls for] a third North Korea-U.S. summit, we would agree to it one more time." "However, we will not be obsessed with holding a summit merely because of our thirst for sanctions relief." North Korean media last week cited Kim as saying that he is open to a third summit with Trump. Kim also set the end of the year as a deadline for the U.S. to come up with mutually acceptable terms for denuclearization. Speaking to reporters in Texas, U.S. Secretary of State Mike Pompeo said he hopes Pyongyang would move forward with its commitment to denuclearize before the end of the year. He stressed that Kim made a promise to denuclearize in June of last year in Singapore, and made that same commitment to himself a handful of times in person.